By 1848, the United States had expanded and extended its borders from the Atlantic to Pacific oceans. From the signing of the Declaration of Independence on July 4, 1776, the fledgling 13 Colonies had expanded westward and from sea to shining sea in merely 72 years, and by doing so it had henceforth removed the presence of the global powers of England, Spain, and France. 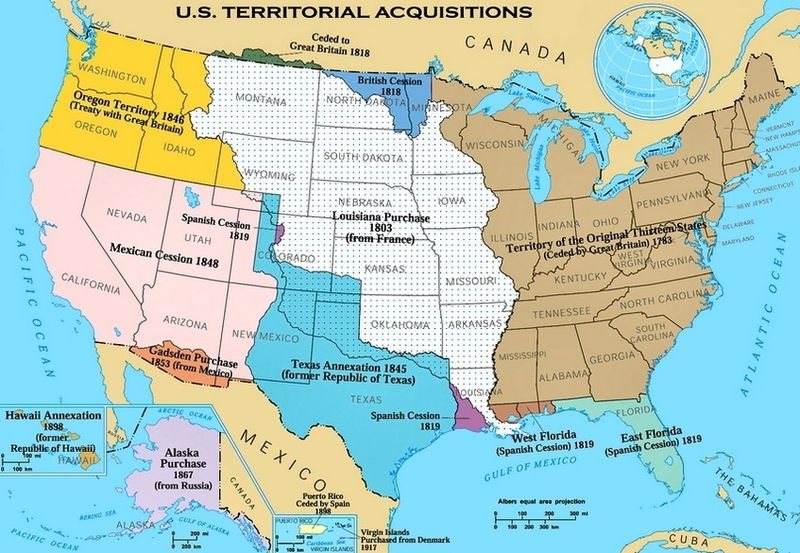 The nation's territorial acquisitions had not been made without controversy, however. Although the U.S. Constitution made no such allowances, the actions of President Thomas Jefferson had doubled the size of the recently formed United States with the Louisiana Purchase of 1803. But it was the result of the war with Mexico (1846-1848) that the nation would again double its size and also place its western border on the Pacific Ocean. In the span of only a few years, the United States had increased its size exponentially with the contentious annexation of Texas in 1845, the 1846 Oregon Treaty with Great Britain for half of the Oregon Country; and acquired California, Nevada, Utah, and parts of Arizona, Colorado, New Mexico, and Wyoming as a result of the Mexican-American War in 1848. The change from a deferential, monarchical, ordered, and static society to a liberal, democratic, and commercial one was astonishing, all the more so because it took place without industrialization, urbanization, or the revolution in transportation. It was a revolution of the mind, in which the concept of equality, democracy, and private interest grasped by hundreds of thousands of Americans transformed a country nearly overnight. Exciting, compelling, and sure to provoke controversy, the book will be discussed for years to come. Try the Search Engine for Related Studies: United States Maps, Acquisition of US Territory and Expansionism History of America, Timeline Map, Growth of the United States Map, Maps, Statehood Date, Dates, List, Order, When Each Every State Entered the Union US.